Background: Dietary intake of ω3 polyunsaturated fatty acids (ω3-PUFAs) reduces progression of atherosclerosis and prevents future cardiovascular events. Macrophages are key players in the pathogenesis of aortic aneurysm. The effects of ω3-PUFAs on abdominal aortic aneurysm (AAA) formation and macrophage-mediated inflammation remain unclear. Methods and Results: The AAA model was developed by angiotensin II infusion in apolipoprotein E-deficient mice. Mice were supplemented with eicosapentaenoic acid (EPA) or docosahexaenoic acid (DHA). The development of AAA lesions and macrophage infiltration in the aorta were analyzed. Gene expression of inflammatory markers in aortic tissues and peritoneal macrophages were measured by using quantitative polymerase chain reaction. AAA formation and macrophage infiltration were significantly suppressed after EPA and DHA administration. EPA administration and DHA administration significantly decreased the expression of tumor necrosis factor-α, monocyte chemoattractant protein-1, transforming growth factor-β, matrix metalloproteinases (MMP)-2, MMP-9, and vascular cell adhesion molecule-1 in the aortas. The expression of arginase 2, which is a marker of pro-inflammatory macrophages, was significantly lower and that of Ym1, which is a marker of anti-inflammatory macrophages, and was significantly higher after EPA and DHA administration. The same trends were observed in peritoneal macrophages after EPA and DHA administration. Atherosclerosis is implicated in the pathogenesis of aortic aneurysms. Inflammation, oxidative stress and proteolysis contribute to the progression of aortic degeneration and the accumulation of inflammatory cells.4,5 Monocytes differentiate into macrophages in the intima and secrete inflammatory mediators, resulting in the onset of arterial wall degeneration. Macrophages have at least 2 different phenotypes: classically activated M1 macrophages and alternatively activated M2 macrophages.6 M1 macrophages are induced by pro-inflammatory mediators and have enhanced pro-inflammatory cytokine production. M2 macrophages have low pro-inflammatory cytokine expression and generate high levels of anti-inflammatory cytokines. However, the effects of ω3-PUFAs, including EPA and docosahexaenoic acid (DHA) on AAA formation and macrophage-mediated inflammation remain unclear. The experimental AAA model induced by angiotensin II (AngII) infusion in apolipoprotein E (apoE)-deficient mice was first developed by Daugherty et al.15 Since then, several studies utilized this experimental model which is caused by an inflammatory process to elucidate the pathophysiology of AAA formation.16 Therefore, in the present study, we assessed the effect of ω3-PUFAs on AAA formation and macrophage-mediated inflammation in the AAA murine model. All animal procedures were approved by the institutional review board of Juntendo University (Tokyo, Japan). All animal experiments were performed in accordance with the “Guide for the Care and Use of Laboratory Animals” published by the US National Institute of Health (NIH Publication, 8th edition, 2011). apoE-deficient mice (apoE−/− mice, C57BL/6 background) were purchased from the Jackson Laboratory (West Grove, PA, USA).17 Details are described in the Supplementary Material online. To assess the effects of ω3-PUFAs on AAA initiation and development, from week 10, male ApoE −/− mice were divided into the following 4 groups: (1) the control group that was infused with saline for 28 days from weeks 12 to 16; (2) the AngII group that was infused with AngII for 28 days from weeks 12 to 16; (3) the EPA group that was orally administered 5% w/w EPA daily from weeks 10 to 16 and that was infused with AngII from weeks 12 to 16, and (4) the DHA group that was orally administered 5% w/w DHA daily from weeks 10 to 16 and that was infused with AngII from weeks 12 to 16. To assess the effects of ω3-PUFAs on AAA progression, mice were preceded 1 week of AngII infusion from week 12, before being divided into the following 3 groups with or without ω3-PUFAs: (1) the AngII group; infused with AngII for 3 weeks from weeks 13 to 16; (2) the EPA group; orally administered 5% w/w EPA daily with AngII infusion for 3 weeks from weeks 13 to 16; and (3) the DHA group; orally administered 5% w/w DHA daily with AngII infusion for 3 weeks from weeks 13 to 16. At week 16, mice were sacrificed with an inhalation overdose of isoflurane (Wako Pure Chemical Industries, Ltd, Osaka, Japan). Details are described in the supplementary material online. Abdominal aortas, cleaned of adventitial fats under a dissecting microscope, were excised from under the diaphragm to the iliac bifurcation and then snap frozen in optimum cutting temperature compound. Details are described in the supplementary material online. The harvested thoracoabdominal aortas and mouse peritoneal macrophages were assessed via quantitative PCR.20 Details are described in the supplementary material online. Statistical analysis was performed by using JMP software (SAS Institute Inc, Cary, NC, USA). Details are described in the supplementary material online. There were no significant differences in body weight at week 12 among the 4 groups. The body weight was significantly lower in the DHA group than in the control group at week 16. There were no significant differences in blood pressure and heart rate at weeks 12 and 16 among the 4 groups (Table 1). Data are expressed as the mean±SD. Ang, angiotensin; EPA, eicosapentaenoic acid; DHA, docosahexaenoic acid; BW, body weight; SBP, systolic blood pressure; HR, heart rate. *P<0.05 vs. Control, using pair-wise comparisons. After administration of EPA and DHA from weeks 10 to 16, the plasma levels of total cholesterol (TC) and low-density lipoprotein cholesterol (LDL-C) were significantly decreased compared with the control and AngII groups. The plasma levels of high-density lipoprotein cholesterol (HDL-C) in the EPA and the DHA groups were also decreased compared with those in the AngII group. There were no significant differences in the LDL-C:HDL-C ratio among the 4 groups. The administration of ω3-PUFAs had no effect on the level of plasma TGs in this model. Serum EPA levels were markedly increased in the EPA group. DHA administration significantly increased serum levels of EPA and DHA (Table 2). Data are expressed as the mean±SD. LDL-C, low-density lipoprotein cholesterol; HDL-C, high-density lipoprotein cholesterol. Other abbreviations as in Table 1. #P<0.05 vs. Control, *P<0.05 vs. AngII, †P<0.05 vs. EPA, using pair-wise comparisons. All aortic aneurysms induced by AngII infusion developed between the diaphragm and renal artery bifurcation. The incidence of AAA formation was significantly prevented in the EPA and DHA groups compared with the AngII group (AngII group, 55.6%; EPA group, 5.9%; DHA group, 0%) (Figures 1A,B). The maximal abdominal aortic diameter (mm) adjusted by body weight (mg) in the AngII group (62.1±22.4 mm/mg) was significantly increased compared with that in the control group (29.8±4.8 mm/mg). 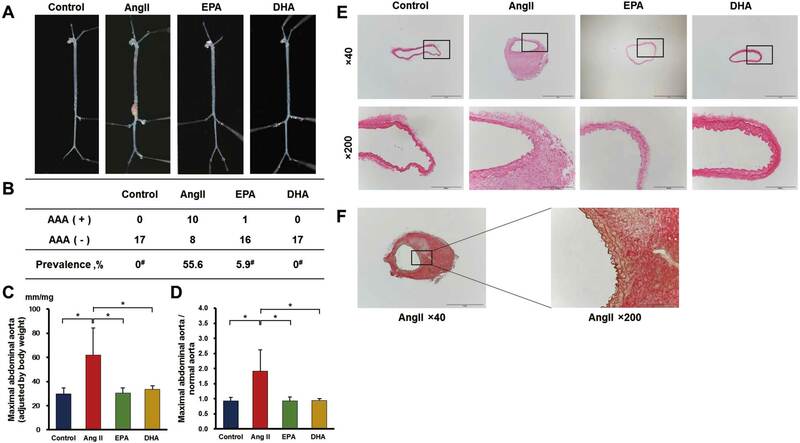 ω3-PUFA administration significantly decreased the maximal aortic diameter (EPA group, 30.5±4.3 mm/mg; DHA group, 33.4±3.1 mm/mg) compared with the AngII group (Figure 1C). The ratio of the maximal abdominal aortic diameter to the adjacent normal aortic diameter was significantly increased in the AngII group (1.91±0.71) compared with the control group (0.92±0.12), and it was significantly decreased in the ω3-PUFA groups (EPA group, 0.92±0.14; DHA group, 0.95±0.06) (Figure 1D). In an additional experiment from Study Protocol 2, EPA and DHA also showed inhibitory effects against AAA progression (Figures S1A,B). Morphological and histological changes of the aortas (Study Protocol 1). (A) Morphological changes in abdominal aortas. (B) Development of abdominal aortic aneurysms (AAA) across the 4 groups significantly differed (P<0.0001 for chi-squared test). Both eicosapentaenoic acid (EPA) and docosahexaenoic acid (DHA) significantly inhibited formation of AAA. (C,D) Both maximal abdominal aortic diameters adjusted by the body weight of each mouse and the ratio of maximal abdominal aortic diameter divided by the adjacent normal aortic diameter significantly differed across the 4 groups (P<0.0001 for analysis of variance). Data are presented as means±standard deviations. #P<0.05 vs. angiotensin (Ang)II (after Bonferroni adjustment) using for pair-wise comparisons; *P<0.01, using pair-wise comparisons. (E) Histological analysis of the aorta. Hematoxylin and eosin (H&E) staining showed medial thickness and infiltration of inflammatory cells in the adventitia induced by AngII administration (scale bar=1 mm at ×40 magnification, scale bar=100 µm at ×200 magnification). (F) Elastin van Gieson staining revealed degeneration and destruction of the medial elastic layers of mice in the AngII group (scale bar=1 mm at ×40 magnification, scale bar=100 µm at ×200 magnification). Hematoxylin & eosin (H&E) staining showed that pathological findings of AAA formation included unusual medial thickening and high infiltration of inflammatory cells to the adventitia (Figure 1E). Elastin van Gieson staining revealed that AngII infusion resulted in the degeneration and destruction of the medial elastic layers, along with the production of many fibrillary elements in the adventitia (Figure 1F). Both EPA and DHA prevented the accumulation of inflammatory cells in the aortic wall, which was maintained at an almost normal state. In the AngII group, an abundance of invasive macrophages was observed in the aortic wall (Figure 2A). The number of F4/80-positive macrophages was significantly lower in the EPA and DHA groups than in the AngII group (AngII group, 652.8±77.3cells/mm2; EPA group, 59.2±19.3cells/mm2; DHA group, 48.0±16.0cells/mm2; control group, 25.6±13.1cells/mm2) (Figure 2B). In an additional experiment from Study Protocol 2, the numbers of F4/80-positive macrophages in the EPA and DHA groups were also significantly lower than in the AngII group (Figure S1C). Conversely, the media and adventitia were thickened in the AngII group compared with the other groups, even in the non-aneurysmal aorta (Figure S2). Although AngII infusion induced the accumulation of significantly higher numbers of F4/80-positive macrophages than in the control group, EPA and DHA administration suppressed macrophage infiltration, even in the non-aneurysmal segments (Figure S3). Immunohistochemical analysis of the aortas (Study Protocol 1). (A) Immunostaining with anti-F4/80 antibody defined the invasion of macrophages into media and especially the adventitia of the aneurysmal wall (scale bar=1 mm at ×40 magnification, scale bar=100 µm at ×200 magnification). (B) Both eicosapentaenoic acid (EPA) and docosahexaenoic acid (DHA) significantly suppressed invasion of macrophages into the aortic wall [Control (n=6), 25.6±13.1 cells/mm2; angiotensin (Ang)II (n=6), 652.8±77.3 cells/mm2; EPA (n=6), 59.2±19.3 cells/mm2; DHA (n=6), 48.0±16.0 cells/mm2, P<0.0001 for analysis of variance]. Data are presented as means±standard deviations. *P<0.01, using pair-wise comparisons. The expression of tumor necrosis factor-α (TNF-α), monocyte chemoattractant protein-1 (MCP-1) and interleukin 1-β (IL-1β) were significantly higher in the AngII group than in the control group. 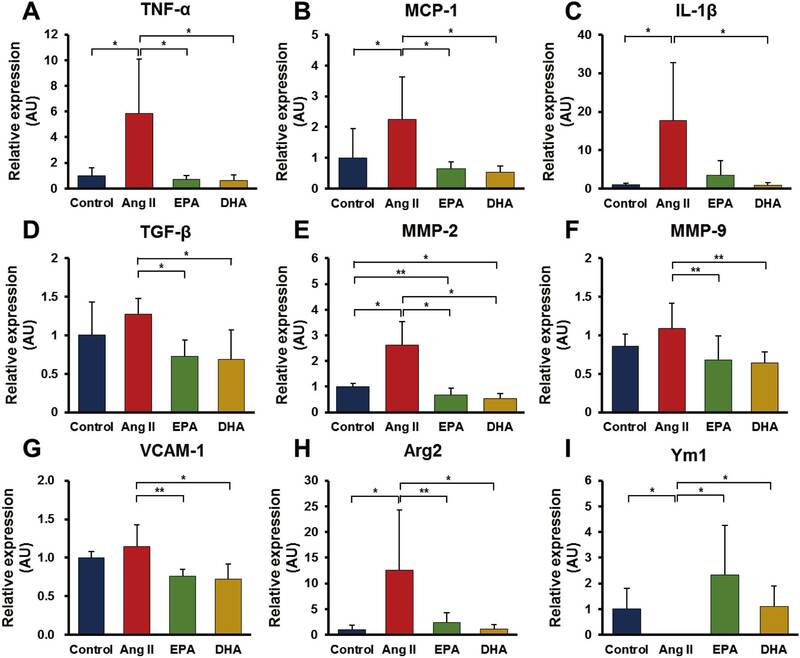 Both EPA and DHA significantly decreased TNF-α and MCP-1 expression induced by AngII infusion, whereas IL-1β expression was significantly decreased only after DHA administration (Figures 3A–C). Although AngII infusion did not activate transforming growth factor β (TGF-β) expression compared with the control group, ω3-PUFA administration significantly decreased TGF-β expression (Figure 3D) and significantly suppressed the expression of matrix metalloproteinase-2 (MMP-2) and MMP-9, compared with the AngII group (Figures 3E,F). In an additional experiment from Study Protocol 2, MCP-1 and MMP-2 expression were significantly lower in the EPA groups than in the AngII group (Figure S4). Gelatin zymography confirmed the quantitative PCR results for MMP-2 and MMP-9 (Figure S5). Furthermore, EPA administration and DHA administration significantly decreased the expression of vascular cell adhesion molecule-1 (VCAM-1) compared with the AngII group (Figure 3G). Arginase2 (Arg2), which is located in the mitochondria and is strongly associated with promoting inflammatory responses in M1 macrophages,21,22 was significantly more expressed in the AngII group than in the control group. Administration of EPA and DHA markedly decreased Arg2 expression (Figure 3H). In contrast, expression of chitinase-3-like protein 3 (Ym1), which is a specific marker of M2 macrophages, was significantly decreased in the AngII group compared with the control group, whereas it was significantly activated in the EPA and DHA groups (Figure 3I).13,23 In addition, we performed the immunostaining on M1 and M2 macrophages in the aortas. The Arg2 staining showed that the number of Arg2-positive macrophages was significantly higher in the AngII group than in the other groups (Figures 4A,B). The distribution of M1 macrophages was identical to that of F4/80-positive cells. In contrast, Ym1 staining showed that the number of Ym1-positive macrophages was significantly increased in the EPA and DHA groups compared with the AngII group (Figures 4C,D). Gene expression analysis of the aortas (Study Protocol 1). (A) Tumor necrosis factor (TNF)-α, (B) monocyte chemoattractant protein (MCP)-1, (C) interleukin (IL)-1β, (D) transforming growth factor (TGF)-β, (E) matrix metalloproteinase (MMP)-2, (F) MMP-9, (G) vascular cell adhesion molecule (VCAM)-1, (H) arginase (Arg)2, and (I) chitinase-3-like protein 3 (Ym1) in total aortas as analyzed by quantitative polymerase chain reaction. There were 6 animals in each group. Data are presented as means±standard deviations. (A–E,G–I) P<0.01 for analysis of variance; (F) P<0.05 for analysis of variance, *P<0.01 and **P <0.05, using pair-wise comparisons. AU, arbitrary units. Immunohistochemical analysis of M1 and M2 macrophages in the aneurysmal aortas (Study Protocol 1). (A) The immunostaining with anti-Arginase2 antibody defined the invasion of M1 macrophages into the media and adventitia of the aneurysmal aorta (scale bar=1 mm at ×40 magnification, scale bar=100 µm at ×200 magnification). (B) Both eicosapentaenoic acid (EPA) and docosahexaenoic acid (DHA) significantly suppressed the invasion of M1 macrophages into the aortic wall [Control (n=5), 9.6±2.6 cells/mm2; angiotensin (Ang)II (n=5), 636.4±65.1 cells/mm2; EPA (n=5), 19.6±3.3 cells/mm2; DHA (n=5), 14.8±4.6 cells/mm2, P<0.0001 for analysis of variance]. (C) Immunohistochemical analysis of M2 macrophages in the aneurysmal aortas. The immunostaining with anti-chitinase-3-like protein 3 (Ym1) antibody defined the invasion of M2 macrophages into the aneurysmal aorta (scale bar=1 mm at ×40 magnification, scale bar=100 µm at ×200 magnification). (D) Both EPA and DHA significantly increased the invasion of M2 macrophages into the aortic wall [Control (n=5), 29.6±4.8 cells/mm2; AngII (n=5), 8.4±7.0 cells/mm2; EPA (n=5), 48.8±11.5 cells/mm2; DHA (n=5), 45.2±8.0 cells/mm2, P<0.0001 for analysis of variance]. Data are presented as means±standard deviations. *P<0.01 and **P<0.05, using pair-wise comparisons. mRNA expression in peritoneal macrophages was analyzed via quantitative PCR. At week 12, IL-6 expression was significantly decreased in the EPA and DHA groups compared with the control group, whereas Ym1 expression was significantly increased in the EPA and DHA groups compared with the control group (Figures 5A–E). At week 16, DHA administration significantly suppressed the high expression of IL-6 and MCP-1 compared with the AngII group (Figures 6A,B). At week 16, Arg2 expression was significantly higher in the AngII group than in the control group, and the high expression of Arg2 induced by AngII infusion was strongly suppressed by EPA and DHA administration (Figure 6C). Conversely, CD206 expression, as a marker of M2, was significantly higher in the DHA group than in other groups at week 16 (Figure 6D).13 Ym1 expression at week 16 was significantly lower in the DHA group than in other groups (Figure 6E). Gene expression analysis of the week 12 peritoneal macrophages (Study Protocol 1). (A) Interleukin (IL)-6, (B) monocyte chemoattractant protein (MCP)-1, (C) arginase (Arg)2, (D) CD206, and (E) chitinase-3-like protein 3 (Ym1) at week 12 in peritoneal macrophages via quantitative polymerase chain reaction. There were 6 animals in each group. Data are presented as means±standard deviations. (E) P<0.01 for analysis of variance. (A) P<0.05 for analysis of variance, *P<0.01 and **P<0.05, using pair-wise comparisons. AU, arbitrary units; DHA, docosahexaenoic acid; EPA, eicosapentaenoic acid. Gene expression analysis of week 16 peritoneal macrophages (Study Protocol 1). (A) Interleukin (IL)-6, (B) monocyte chemoattractant protein (MCP)-1, (C) arginase (Arg)2, (D) CD206, and (E) chitinase-3-like protein 3 (Ym1) at week 16 in peritoneal macrophages via quantitative polymerase chain reaction. There were 6 animals in each group. Data are presented as means±standard deviations. (A–E) P<0.01 for analysis of variance, *P<0.01 and **P<0.05, using pair-wise comparisons. AU, arbitrary units; DHA, docosahexaenoic acid; EPA, eicosapentaenoic acid. In the present study, EPA administration and DHA administration dramatically inhibited the development of AAA and aortic degeneration induced by AngII infusion without antihypertensive effects. To the best of our knowledge, this is the first report to demonstrate the effectiveness of EPA and DHA administration to prevent AAA formation. Histological and immunohistochemical analyses showed that EPA and DHA administration strongly suppressed the structural destruction of medial elastic layer and also suppressed macrophage infiltration in both the aneurysmal and non-aneurysmal aortic wall. Quantitative PCR analysis with aortic tissue showed that EPA administration and DHA administration significantly decreased VCAM-1 expression and also suppressed the expression of TNF-α, MCP-1 and TGF-β, which play major roles in macrophage activation. Growing evidences are being accumulated regarding the fact that ω3-PUFA administration can decrease the expression of MCP-1 and endothelial adhesion molecules, such as intercellular adhesion molecule-1, VCAM-1 and selectin, resulting in the inhibition of macrophage invasion into the vascular endothelium.24,25 Thus, the endothelium macrophage interaction and the inflammatory mediators secreted by infiltrating cells triggered by AngII infusion may be suppressed by administration of ω3-PUFAs, which is more likely to enhance the mechanism underlying the suppression of vascular inflammation and remodeling. Moreover, several studies demonstrated that matrix-degrading enzymes, such as MMP-2 and MMP-9, are key players in AAA progression26 and macrophage-derived and vascular cell-derived MMPs are associated with AAA progression.27 Indeed, ω3-PUFAs suppressed MMPs and prevented AAA formation in the present study. 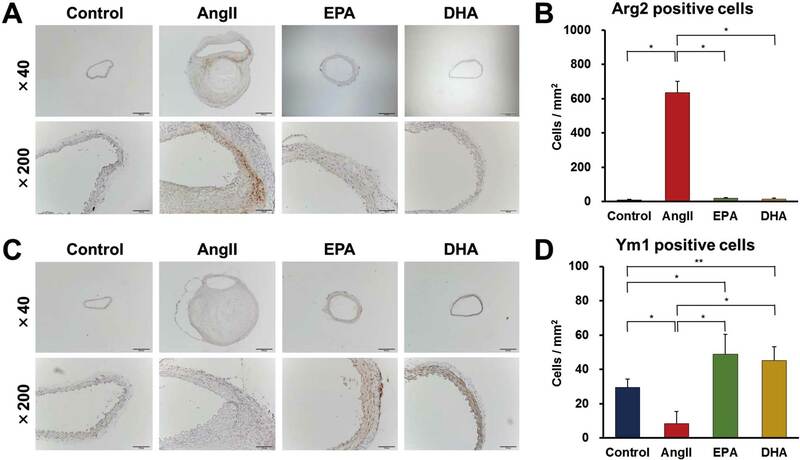 Therefore, in this model, the effects of EPA and DHA in reducing AAA formation can be explained by the fact that both ω3-PUFAs drastically diminished aortic inflammation induced by macrophage infiltration. Conversely, Arg2 and Ym1 expression in the aortic tissues suggested another potential role for ω3-PUFAs in AAA pathogenesis. After EPA and DHA administration, Arg2 expression was decreased, whereas Ym1 expression was increased. Moreover, we confirmed similar trends in the aortas using Arg2 and Ym1 immunostaining. The in vitro findings of the present study demonstrate the anti-inflammatory effects of ω3-PUFAs in detail. After only 2 weeks of EPA or DHA administration, IL-6 expression was already decreased, whereas Ym1 was increased. These findings suggest that inflammation was ameliorated by oral administration of EPA or DHA. After inflammatory stimulus via AngII infusion for 4 weeks, the anti-inflammatory condition produced by ω3-PUFAs was sustained. At week 16, ω3-PUFA administration inhibited proinflammatory responses. A previous study showed that ω3-PUFA administration negatively regulated macrophage inflammation by inhibition of nuclear factor κ-light-chain-enhancer of activated B cells (NF-κB) signaling.28 Xue et al28 reported that silent mating type information regulation 2 homolog 1 (SIRT-1) and adenosine monophosphate-activated protein kinase pathways were activated by ω3-PUFA administration and, in turn, deacetylated the NF-κB subunit p65 and downregulated its signaling. More recently, Kauppinen et al29 reported the molecular mechanisms of the antagonistic regulation between NF-κB and SIRT-1 as well as the anti-inflammatory response of SIRT-1.29 These data indicated that ω3-PUFAs have combined anti-inflammatory effects and cause macrophage polarization toward the M2 phenotype. Both EPA and DHA have been reported to have some beneficial effects on inflammation and oxidative stress.30 Multiple pathways of EPA and DHA with different time frames on inflammatory responses may be explained. 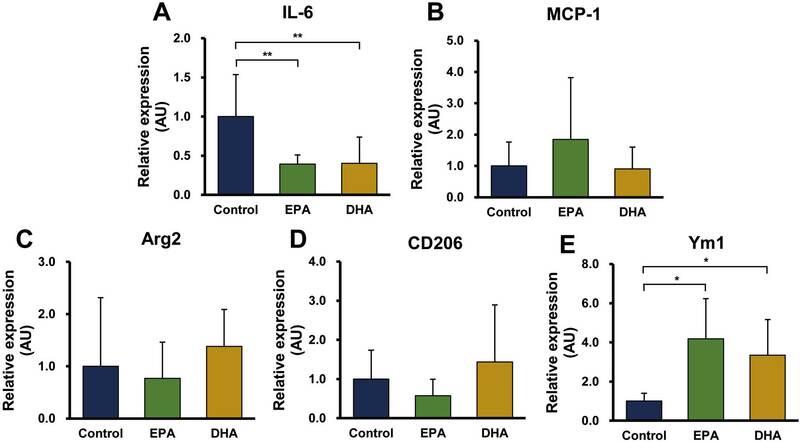 A recent study demonstrated that both EPA and DHA administration decreased pro-inflammatory markers in an in vitro experiment, and DHA but not EPA had a stimulatory effect on the anti-inflammatory M2 marker, CD206.31 DHA and its metabolite also increased the expression of CD206 of macrophages in inflamed adipose tissue.32 Conversely, previous studies reported Th2 cells signaling to promote M2 macrophage activation.33,34 We assessed the number of Th1 and Th2 cells in splenocytes. The results demonstrated that in this model, AngII infusion and ω3-PUFAs administration did not induce the shift from Th1 cells to Th2 cells (Figure S6). The hematological assessment demonstrated that both EPA and DHA decreased serum TC and LDL-C levels. The preventing effect on AAA development may possibly be associated with improvement in dyslipidemia with ω3-PUFAs treatment. In the present study, the LDL-C:HDL-C ratio and serum TG levels did not significantly differ between the 4 groups. Fish oil is considered to be a potent TG-lowering agent in humans, for which some mechanisms have been partially identified.35,36 Conversely, Asset et al37 suggested that fish oil does not decrease TG levels in apoE-deficient mice, which may be attributable to the peculiarity caused by the absence of the serum apoE protein. Although ω3-PUFAs have been shown to improve some serum lipid parameters, further studies are needed to investigate whether ω3-PUFAs play some part in the inhibition of AAA development through the improvement of lipid profiles. Most animal studies have depended on a chemically induced aortic degeneration over a short period using genetically modified mice. Those studies have focused on the importance of inflammation, proteolysis and oxidative stress in aortic degeneration. In human and animal experiments, ω3-PUFA administration was shown to decrease the blood levels of prophlogistic eicosanoids and inflammatory cytokines, such as TNF-α, IL-1 and IL-6.38,39 To investigate the effects of ω3-PUFA administration on AAA pathogenesis, we used an AngII infusion-induced AAA murine model. This AAA model did not exhibit high blood pressure. In the clinical situation, human AAA is usually related to a history of high blood pressure, particularly in patients with hypertension. It was reported that increases in blood pressure induced by AngII did not appear to account for the development of AAA.40 We believe the results of this present study to be important because the effects of ω3-PUFAs on AAA formation and macrophage-mediated inflammation were not influenced by high blood pressure. Moreover, the use of higher doses of ω3-PUFAs, compared with the optimum doses for humans, and the histological difference in aortas between human and animal models, may be limitations to this animal experiment.25,41 In addition, the immunostaining and quantitative PCR data are presented; however, another experiment involving characterizing M1 and M2 phenotypes in peritoneal macrophages and/or isolating aorta would convincingly substantiate our conclusions. This is also a limitation of this study. Peripheral circulating cells at week 16 were isolated and flow cytometry measurements were performed. The number of mature monocytes (CD45+, CD11b+, Ly6c+ and CCR2+ cells) in the AngII group was increased, but tended to decrease in the EPA and DHA groups (data not shown). It was reported that AngII infusion increased inflammatory mature monocytes, which differentiate into M1 macrophage in the bloodstream.42 Both EPA and DHA may have the potential to inhibit AAA development by reducing the number of inflammatory monocytes. We assessed the inhibitory effects of ω3-PUFAs on early changes in the aorta after 5 days of AngII infusion, as per Study Protocol 1. In this early phase before aneurysmal formation, the accumulation of macrophages on the aortic wall was observed even after 5 days of AngII infusion. The EPA and DHA administration prevented the accumulation of macrophages, particularly M1 macrophages, in the aortic wall (Figures S7–S9). 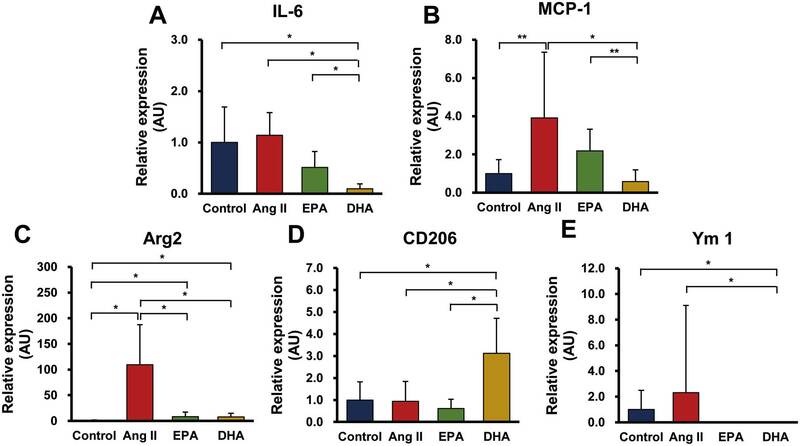 These data demonstrated that EPA and DHA have inhibitory effects against the early changes of macrophage accumulation and the inflammatory response induced by AngII infusion. In the future, more sophisticated analyses and models may be required to confirm these findings. In conclusion, dietary intake of EPA and DHA prevented AAA development through the inhibition of aortic- and macrophage-mediated inflammation. These results suggest that ω3-PUFAs may have beneficial effects against AAA formation induced by AngII stimulation. We are grateful to the Atopy (Allergy) Research Center for maintenance of the apoE-deficient mice. We wish to thank H. Nakano, T. Ikeda and T. Ikegami from the Laboratory Molecular and Biochemical Research, Research Support Center, Juntendo University Graduate School of Medicine; S. Nakamura from the Laboratory of Biomedical Imaging Research, BioMedical Research Center, Juntendo University Graduate School of Medicine; K. Sumiyoshi from the Research Institute for Diseases of Old Age; and T. Kasai from the Department of Cardiovascular Medicine, Juntendo University Graduate School of Medicine, for their excellent technical advice. This work was supported by a MEXT (Ministry of Education, Culture, Sports, Science and Technology)-Supported Program for the Strategic Research Foundation at Private Universities, Japan, and a Grant-in-Aid for Scientific Research from the Japan Society for the Promotion of Science, Japan (C-23500620). This study was partially funded by Mochida Pharmaceutical Co Ltd, Tokyo, Japan. K.S. received lecture fees from Mochida Pharmaceutical Co Ltd (Tokyo, Japan) and Takeda Pharmaceutical Co Ltd (Osaka, Japan). H.D. received scholarship funds and lecture fees from Mochida Pharmaceutical Co Ltd and Takeda Pharmaceutical Co Ltd. Figure S1. Development of abdominal aortic aneurysms (AAA) and histological changes of the aortas (Study Protocol 2). Figure S2. Histological analysis of non-aneurysmal aortas (Study Protocol 1). Figure S3. Histological changes of the non-aneurysmal aortas (Study Protocol 1). Figure S4. Gene expression analysis of the aortas (Study Protocol 2). Figure S5. Expression of matrix metalloproteinase (MMP)-2 and MMP-9 proteins in the aortas (Study Protocol 1). Figure S6. Number of T lymphocytes, Th1, and Th2 cells in splenocytes (Study Protocol 1). Figure S7. Ratio of maximal abdominal aortic diameter divided by adjacent normal aortic diameter after 5 days of angiotensin (Ang)II infusion. Figure S8. F4/80 immunohistochemical analysis of the aortas after 5 days of angiotensin (Ang) II infusion. Figure S9. Arginase (Arg)2 immunohistochemical analysis of the aortas after 5 days of angiotensin (Ang)II infusion. 1. Sakata R, Fujii Y, Kuwano H. Thoracic and cardiovascular surgery in Japan during 2008: Annual report by the Japanese Association for Thoracic Surgery. Gen Thorac Cardiovasc Surg 2010; 58: 356–383. 2. Kajimoto K, Miyauchi K, Kasai T, Shimada K, Kojima Y, Shimada A, et al. Short-term 20-mg atorvastatin therapy reduces key inflammatory factors including c-Jun N-terminal kinase and dendritic cells and matrix metalloproteinase expression in human abdominal aortic aneurysmal wall. Atherosclerosis 2009; 206: 505–511. 3. Moran CS, McCann M, Karan M, Norman P, Ketheesan N, Golledge J. Association of osteoprotegerin with human abdominal aortic aneurysm progression. Circulation 2005; 111: 3119–3125. 4. Libby P. Inflammation in atherosclerosis. Nature 2002; 420: 868–874. 5. Shimada K. Immune system and atherosclerotic disease heterogeneity of leukocyte subsets participating in the pathogenesis of atherosclerosis. Circ J 2009; 73: 994–1001. 6. Hirose K, Iwabuchi K, Shimada K, Kiyanagi T, Iwahara C, Nakayama H, et al. Different responses to oxidized low-density lipoproteins in human polarized macrophages. Lipids Health Dis 2011; 10: 1. 7. Dyerberg J, Bang HO. A hypothesis on the development of acute myocardial infarction in Greenlanders. Scand J Clin Lab Invest Suppl 1982; 161: 7–13. 8. Iso H, Kobayashi M, Ishihara J, Sasaki S, Okada K, Kita Y, et al; JPHC Study Group. Intake of fish and n3 fatty acids and risk of coronary heart disease among Japanese: The Japan Public Health Center-Based (JPHC) Study Cohort I. Circulation 2006; 113: 195–202. 9. Hara M, Sakata Y, Nakatani D, Suna S, Usami M, Matsumoto S, et al; Osaka Acute Coronary Insufficiency Study (OACIS) Investigators. Low levels of serum n-3 polyunsaturated fatty acids are associated with worse heart failure-free survival in patients after acute myocardial infarction. Circ J 2013; 77: 153–162. 10. Yokoyama M, Origasa H, Matsuzaki M, Matsuzawa Y, Saito Y, Ishikawa Y, et al; Japan EPA Lipid Intervention Study (JELIS) Investigators. Effects of eicosapentaenoic acid on major coronary events in hypercholesterolaemic patients (JELIS): A randomised open-label, blinded endpoint analysis. Lancet 2007; 369: 1090–1098. 11. Kromhout D, Giltay EJ, Geleijnse JM; Alpha Omega Trial Group. n-3 fatty acids and cardiovascular events after myocardial infarction. N Engl J Med 2010; 363: 2015–2026. 12. Lumeng CN, Bodzin JL, Saltiel AR. Obesity induces a phenotypic switch in adipose tissue macrophage polarization. J Clin Invest 2007; 117: 175–184. 13. Fujisaka S, Usui I, Bukhari A, Ikutani M, Oya T, Kanatani Y, et al. Regulatory mechanisms for adipose tissue M1 and M2 macrophages in diet-induced obese mice. Diabetes 2009; 58: 2574–2582. 14. Itoh M, Suganami T, Satoh N, Tanimoto-Koyama K, Yuan X, Tanaka M, et al. Increased adiponectin secretion by highly purified eicosapentaenoic acid in rodent models of obesity and human obese subjects. Arterioscler Thromb Vasc Biol 2007; 27: 1918–1925. 15. Daugherty A, Manning MW, Cassis LA. Angiotensin II promotes atherosclerotic lesions and aneurysms in apolipoprotein E-deficient mice. J Clin Invest 2000; 105: 1605–1612. 16. Daugherty A, Cassis LA. Mouse models of abdominal aortic aneurysms. Arterioscler Thromb Vasc Biol 2004; 24: 429–434. 17. Zhang SH, Reddick RL, Piedrahita JA, Maeda N. Spontaneous hypercholesterolemia and arterial lesions in mice lacking apolipoprotein E. Science 1992; 258: 468–471. 18. Sumiyoshi K, Mokuno H, Iesaki T, Shimada K, Miyazaki T, Kume A, et al. Deletion of the Fc receptors γ chain preserves endothelial function affected by hypercholesterolemia in mice fed on a high-fat diet. Cardiovasc Res 2008; 80: 463–470. 19. Yanagisawa N, Shimada K, Miyazaki T, Kume A, Kitamura Y, Ichikawa R, et al. Polyunsaturated fatty acid levels of serum and red blood cells in apparently healthy Japanese subjects living in an urban area. J Atheroscler Thromb 2010; 17: 285–294. 20. Fukao K, Shimada K, Naito H, Sumiyoshi K, Inoue N, Iesaki T, et al. Voluntary exercise ameliorates the progression of atherosclerotic lesion formation via anti-inflammatory effects in apolipoprotein E-deficient mice. J Atheroscler Thromb 2010; 17: 1226–1236. 21. Khallou-Laschet J, Varthaman A, Fornasa G, Compain C, Gaston AT, Clement M, et al. Macrophage plasticity in experimental atherosclerosis. PLoS One 2010; 5: e8852, doi:10.1371/journal.pone.0008852. 22. Ming XF, Rajapakse AG, Yepuri G, Xiong Y, Carvas JM, Ruffieux J, et al. Arginase II promotes macrophage inflammatory responses through mitochondrial reactive oxygen species, contributing to insulin resistance and atherogenesis. J Am Heart Assoc 2012; 1: e000992, doi:10.1161/JAHA.112.000992. 23. Chang NC, Hung SI, Hwa KY, Kato I, Chen JE, Liu CH, et al. A macrophage protein, Ym1, transiently expressed during inflammation is a novel mammalian lectin. J Biol Chem 2001; 276: 17497–17506. 24. Yamada H, Yoshida M, Nakano Y, Suganami T, Satoh N, Mita T, et al. In Vivo and in vitro inhibition of monocyte adhesion to endothelial cells and endothelial adhesion molecules by eicosapentaenoic acid. Arterioscler Thromb Vasc Biol 2008; 28: 2173–2179. 25. Nakajima K, Yamashita T, Kita T, Takeda M, Sasaki N, Kasahara K, et al. Orally administered eicosapentaenoic acid induces rapid regression of atherosclerosis via modulating the phenotype of dendritic cells in LDL receptor-deficient mice. Arterioscler Thromb Vasc Biol 2011; 31: 1963–1972. 26. Xiong W, Mactaggart J, Knispel R, Worth J, Zhu Z, Li Y, et al. Inhibition of reactive oxygen species attenuates aneurysm formation in a murine model. Atherosclerosis 2009; 202: 128–134. 27. Longo GM, Xiong W, Greiner TC, Zhao Y, Fiotti N, Baxter BT. Matrix metalloproteinases 2 and 9 work in concert to produce aortic aneurysms. J Clin Invest 2002; 110: 625–632. 28. Xue B, Yang Z, Wang X, Shi H. Omega-3 polyunsaturated fatty acids antagonize macrophage inflammation via activation of AMPK/SIRT1 pathway. PLoS One 2012; 7: e45990, doi:10.1371/journal.pone.0045990. 29. Kauppinen A, Suuronen T, Ojala J, Kaarniranta K, Salminen A. Antagonistic crosstalk between NF-κB and SIRT1 in the regulation of inflammation and metabolic disorders. Cell Signal 2013; 10: 1939–1948. 30. Mozaffarian D, Wu JH. (n-3) fatty acids and cardiovascular health: Are effects of EPA and DHA shared or complementary? J Nutr 2012; 142: 614–625. 31. Hjorth E, Zhu M, Toro VC, Vedin I, Palmblad J, Cederholm T, et al. Omega-3 fatty acids enhance phagocytosis of Alzheimer’s disease-related amyloid-β42 by human microglia and decrease inflammatory markers. J Alzheimers Dis 2013; 35: 697–713. 32. Titos E, Rius B, González-Périz A, López-Vicario C, Morán-Salvador E, Martínez-Clemente M, et al. Resolvin D1 and its precursor docosahexaenoic acid promote resolution of adipose tissue inflammation by eliciting macrophage polarization toward an M2-like phenotype. J Immunol 2011; 187: 5408–5418. 33. Cardilo-Reis L, Gruber S, Schreier SM, Drechsler M, Papac-Milicevic N, Weber C, et al. Interleukin-13 protects from atherosclerosis and modulates plaque composition by skewing the macrophage phenotype. EMBO Mol Med 2012; 4: 1072–1086. 34. Braga TT, Correa-Costa M, Guise YF, Castoldi A, de Oliveira CD, Hyane MI, et al. MyD88 signaling pathway is involved in renal fibrosis by favoring a TH2 immune response and activating alternative M2 macrophages. Mol Med 2012; 18: 1231–1239. 35. Yoshikawa T, Shimano H, Yahagi N, Ide T, Amemiya-Kudo M, Matsuzaka T, et al. Polyunsaturated fatty acids suppress sterol regulatory element-bindings protein 1c promoter activity by inhibition of liver X receptor (LXR) binding to LXR response elements. J Biol Chem 2002; 277: 1705–1711. 36. Tani S, Nagao K, Matsumoto M, Hirayama A. Highly purified eicosapentaenoic acid may increase low-density lipoprotein particle size by improving triglyceride metabolism in patients with hypertriglyceridemia. Circ J 2013; 77: 2349–2357. 37. Asset G, Baugé E, Fruchart JC, Dallongeville J. Lack of triglyceride-lowering properties of fish oil in apolipoprotein E-deficient mice. Arterioscler Thromb Vasc Biol 2001; 21: 401–406. 38. Duda MK, O’Shea KM, Tintinu A, Xu W, Khairallah RJ, Barrows BR, et al. Fish oil, but not flaxseed oil, decreased inflammation and prevents pressure over-load-induced cardiac dysfunction. Cardiovasc Res 2009; 81: 319–327. 39. Lopez-Garcia E, Schulze MB, Manson JE, Meigs JB, Albert CM, Rifai N, et al. Consumption of (n-3) fatty acids is related to plasma biomarkers of inflammation and endothelial activation in women. J Nutr 2004; 134: 1806–1811. 40. Manning MW, Cassis LA, Daugherty A. Differential effects of doxycycline, a broad-spectrum matrix metalloproteinase inhibitor, on angiotensin II-induced atherosclerosis and abdominal aortic aneurysms. Arterioscler Thromb Vasc Biol 2003; 23: 483–488. 41. Oh DY, Talukdar S, Bae EJ, Imamura T, Morinaga H, Fan W, et al. GPR120 is an omega-3 fatty acid receptor mediating potent anti-inflammatory and insulin-sensitizing effects. Cell 2010; 142: 687–698. 42. Moran CS, Jose RJ, Moxon JV, Roomberg A, Norman PE, Rush C, et al. Everolimus limits aortic aneurysm in the apolipoprotein E-deficient mouse by downregulating C-C chemokine receptor 2 positive monocytes. Arterioscler Thromb Vasc Biol 2013; 33: 814–821.